After Kid’s Club vacations, Rolando and I decided that it would be a lot of fun to start up surf lessons and classes with the kids. Having surfed myself, I understand the dedication, humility and patience that surfing requires; and what better way to teach children important values than through action itself? Naima, a well-known and respected surf instructor here in Puerto Viejo that often takes our volunteers for surfing lessons, was kind enough to donate her time and old boards to the cause. Having our own boards was the majority of the problem of doing surf classes with the kids, because financially for us, renting boards isn’t a feasible option. The boards that were gifted to us were broken, or had many dings and needed lots of cleaning and necessary fixes. However, this turned out to be a perfect situation. Being given old boards gave us the opportunity to teach the kids how an array of lessons while fixing, painting, and reusing broken surfboards. 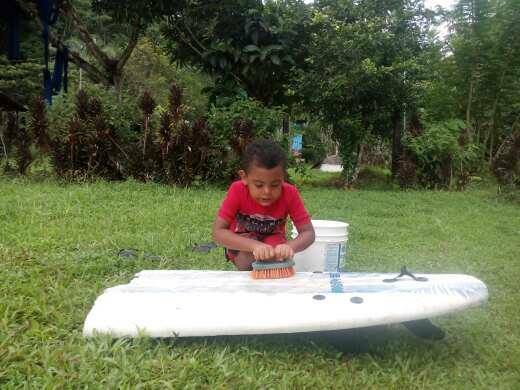 The process of transforming unusable boards into something we could eventually use in the water was an ideal way to teach the kids a couple of important lessons. First, that they have to work for what they want, that it doesn’t just come naturally. If we had just rented the boards, they wouldn’t have had the same rewarding feeling of having worked towards the goal of having repaired their own surfboards. The second lesson being to practice what we preach in Kid’s Club, to utilize the three R’s: Reduce, Reuse and Recycle. Boards that normally would have ended up as rubbish were able to be reused into a usable product. Lastly, the kids, with Naima’s help, learned how to refurbish and repair old foam boards into fishtail and boogie boards. This helped them to practice their motor and mechanical skills while having fun! Keeping the theme of surfing in mind, in between fixing the boards and waiting for foam and paint to dry, we talked about ocean conservation, tips to stay safe while surfing and exercises to improve their surfing skills. We practiced our “pop-ups” to efficiently go from laying to standing on top of their boards, we talked about the rip tides and ocean currents that can affect surfing, how ocean conservation can positively impact surfing and areas where there is tourism due to surfing, and watched video clips about important safety tips while in the ocean with the board. 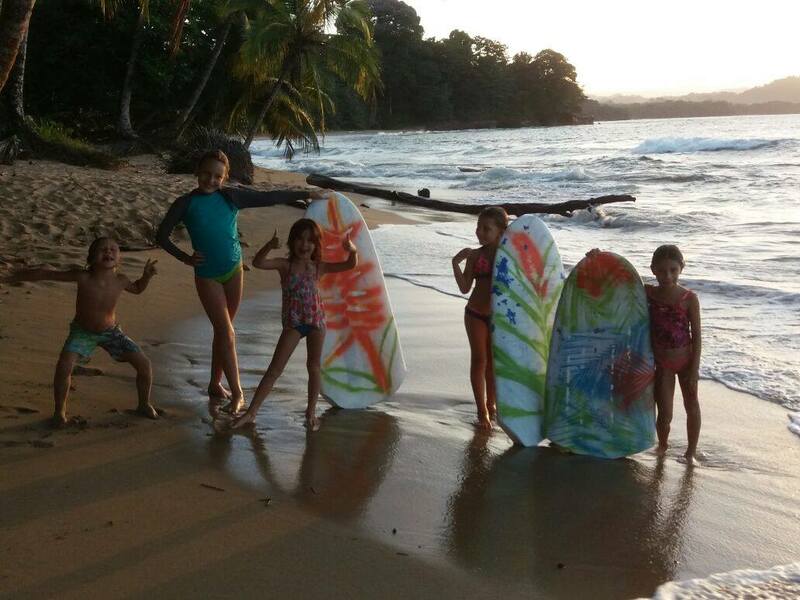 When the boards were finally finished, Rolando took some of the kids to Punta Uva to try out their new boards (wasn’t so much of surfing, just paddling around and having fun on their new products!). Hopefully, when the rainy season ends and the ocean settles down we will be able to use them more! Sea Turtles, Bioluminescence and Full Moons, Oh my!